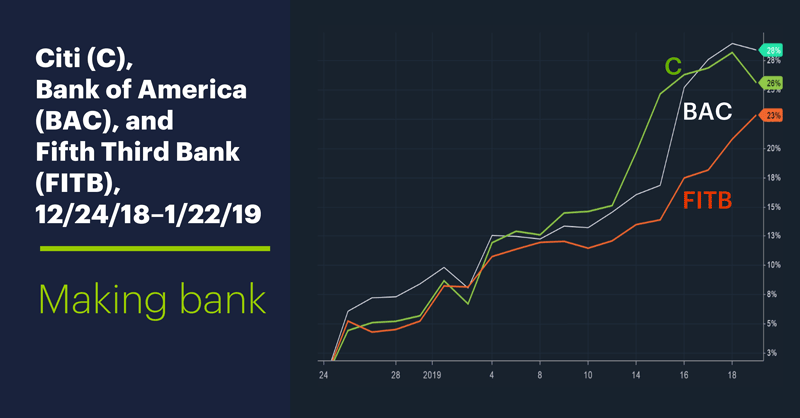 After a spate of strong quarterly numbers from banks kicked off this earnings season, it may seem like the time for catching a move in banking stocks has come and gone. After all, what additional “good news” could be in the pipeline? Several marquee banks, including Citi (C), Bank of America (BAC), and Fifth Third Bank (FITB), have jumped 20% or more off their December lows (chart above). After such a run, though, many experienced traders would understandably be more inclined to think about a possible short-term cooldown in bank shares as interest rotates to other market sectors throughout earnings season. But after accounting for such a pullback—and broad-market conditions willing—these traders may also be looking at a different type of bullish opportunity in certain bank stocks. Why? Because the banking industry is bubbling with talk of industry consolidation, with small- to mid-sized banks being the potential takeover targets. Forecasting “takeover candidate” stocks has long been grist for the stock-market rumor mill. It’s a tough game—deals can materialize or evaporate for reasons that have nothing to do with the attractiveness of a particular company, and that doesn’t even take into account the challenge of timing such trades. 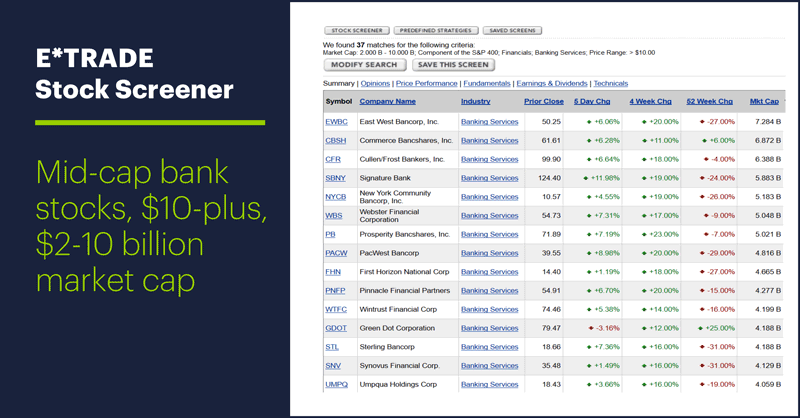 The following screen grab shows part of a representative list of bank stocks found using the E*TRADE stock screener (logon required)—mid-cap bank stocks listed in the S&P 400 Midcap index (MID) that are currently trading above $10/share, and with market caps between $2-$10 billion. But seasoned traders don’t chase a stock willy-nilly just because it’s said to be a potential takeover target—it must also satisfy whatever technical, quantitative, or fundamental criteria the trader typically uses. And the rules of limiting risk with respect to reward always apply, so these traders are likely to wait for bank stocks they find attractive to pull back before attempting any long positions. Also, they’ll likely avoid any low-volume stocks—which many of these small- and mid-sized banks are—to avoid getting into trades they can’t easily get out of. It’s always better to make no trade than rush into a bad one. 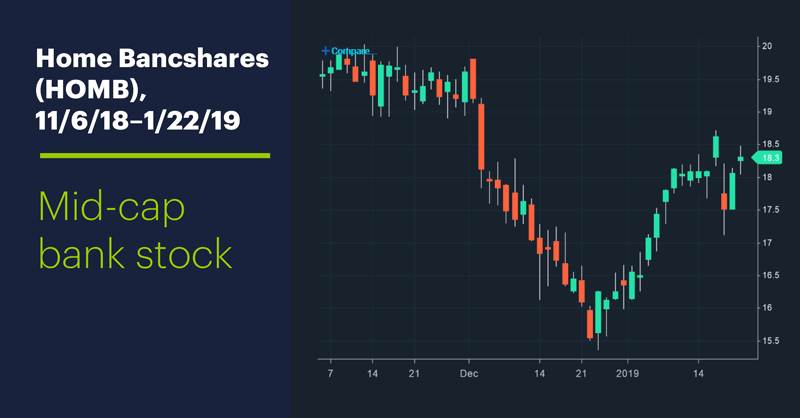 Market Mover Update: Despite yesterday’s broad-market decline, Constellation Brands (STZ) held on to most of Friday’s big gain. Today’s numbers (all times ET): FHFA House Price Index (9:00 a.m.). Today’s earnings include: Abbott Labs (ABT), Comcast (CMCSA), Kimberly-Clark (KMB), Procter & Gamble (PG), United Tech (UTX), Canadian Pacific (CP), F5 Networks (FFIV), Ford Motor (F), Lam Research (LRCX), Teradyne (TER), Texas Instruments (TXN), Xilinx (XLNX). 1 Forbes. The 5 Biggest Trends In Mergers & Acquisitions For 2019. 12/8/18. 2 Bloomberg. BofA’s Moynihan Predicts Another Round of U.S. Bank Mergers. 1/23/19. 3 ABA Banking Journal. A Wind in the Sales? 2019 M&A Outlook. 12/12/18.